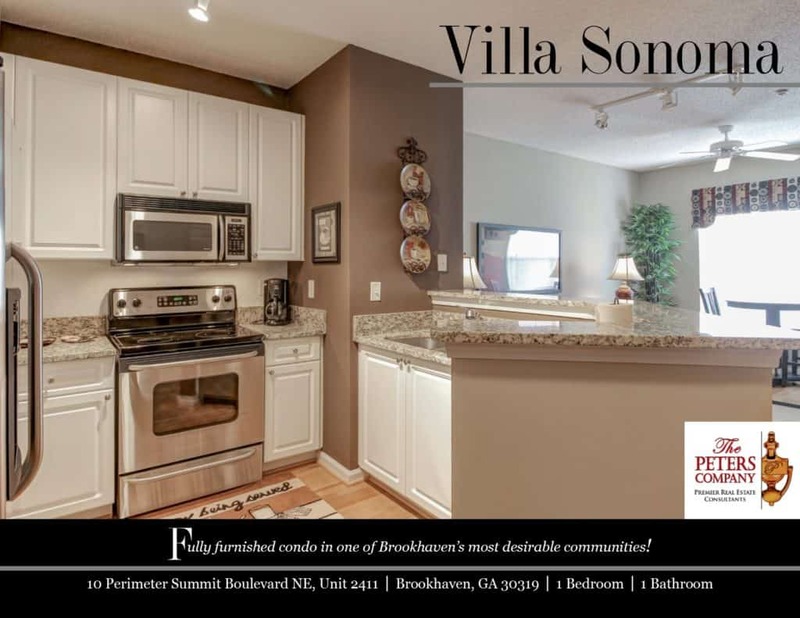 Just Listed :: Furnished Condo in Brookhaven's Villa Sonoma! Welcome home! Nestled in the popular Villa Sonoma community, this condo is just what you’ve been looking for. The open floor plan, custom features, and charming character will never go out of style. Being close to I-285 and GA400 makes virtually all commutes a breeze. You’ll also have easy access to the other highways, byways, and activities that make this location such a well loved destination! Being in this booming area also means you can enjoy many nearby restaurants and shopping spots! This condo is truly in pristine, barely lived in condition as the current owners have used it primarily as a second home! · Kitchen features stainless steel appliances, granite counters, pantry, and breakfast bar. · Natural light pours into the spacious living room. · Tall ceilings and gleaming hardwood floors. · Bedroom is well-sized and bright. · Bathroom has a vanity with stone countertop, large garden tub, and spacious walk-in closet. · Laundry conveniently located in the unit. · Wonderful community amenities include secure access, a well-maintained pool, clubhouse, gym facilities, and walking trails. · One deeded parking space (#208). · Unit comes fully furnished. · Brand new HVAC in unit. ← Just Listed :: Wonderful Contemporary Near Downtown Roswell!